Isn't she a sweetie? There's no hiding the fact that Minnie's in love! Drawing from the original cartoon, artist Jim Shore shows Minnie in flapper-inspired bloomers, a blue printed skirt, and a red sailor cap with flower detail. 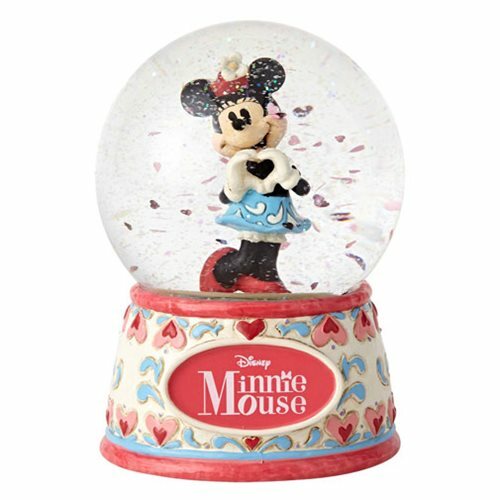 Confetti hearts swirl around her swooning figure when you shake this adorable Disney Traditions Sweetheart Minnie Mouse 5 1/2-Inch Water Globe. Made of stone resin and glass, it measures approximately 5 1/2-inches tall x 4-inches in diameter.